There are many factors that influence UV lamp life and how the lamp is operated and the lamp’s operating environment will ultimately determine useful hours of lamp life. Besides producing UV light, mercury vapor lamps also produce visible light and infrared light. Actually, about 60% of the light produced is in the infrared spectrum. This is because of the high operating temperatures within the lamp. This heat, together with foreign materials deposited on the quartz, causes the quartz to vitrify or decade. This vitrification of the quartz will eventually cause the lamp’s intensity to diminish to a level where it is no longer suited for the application. How the lamp is operated does influence the speed of vitrification. The quick addition or removal of heat generally increases the speed of vitrification. Therefore, the more times power is cycled on the lamp, the quicker the lamp decays. Starts also have another effect on vitrification. During startup, the lamp’s internal pressure is low. As pressure builds, the electrodes sputter off tungsten which is deposited on the inside of the lamp and further promotes vitrification. Excessive starts should therefore be avoided by batching your curing operations together. Another factor influencing vitrification is how the lamp is handled. Any material deposited on the quartz, will cause the quartz to vitrify. This is especially true of the oils on your hands. You should therefore avoid excessive handling of the lamps and always wear clean cotton gloves when replacing lamps. Curing and drying operations also contribute to vitrification as the quartz is exposed to ozone, vapors, hydrocarbons, and volatile gases being emitted from the inks, coatings, or adhesives being cured. 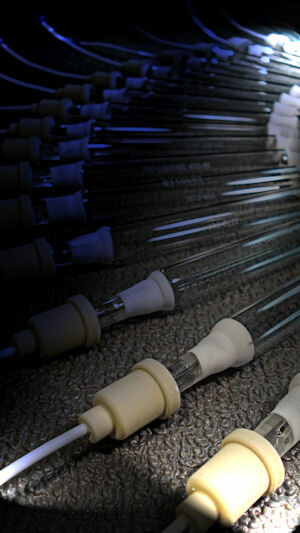 Heat removal is another important factor influencing lamp life. Inadequate cooling and deficient heat removal creates excessively hot operating environments contributing as well to premature vitrification. Under normal handling and operating conditions, your Albatross UV lamp is guaranteed to provide a minimum of 1000 hours of useful life.